Download Voucher 222 voucher(s) downloaded. No small print... Simply a free inspection of the vehicle. 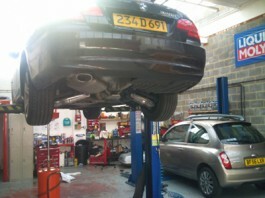 At the beginning of 2011 we established Harrow Auto Service Ltd. Sadly, there are lots of dishonest mechanics and garages on the market. In fact: far too many. That’s why, we decided to take different approach… Honesty is our top priority: we do not carry out any repairs that do not need to be carried out. As simple as that. Our other priorities are top quality work and a clean garage environment. For customers, nothing is worse than to see a mechanic in his greasy overalls sitting in their lovely car with his oily hands on their steering wheel, just after having worked underneath it. You can be sure that such things never happen here. Interior protective covers and gloves are used as routinely as spanners. Our garage can accommodate not only cars and 4x4s but also lower commercial vehicles such as vans (up to 3.1m high) and even small lorries. We don’t care only about your car - we provide a place for you to wait and offer you free use our Wi-Fi network while you do so. If you rather prefer to spend that time shopping, St George's & st Ann's are just a 10 minute walk away.